I have a confession to make: I use an adblocker. (To be fair, I subscribe to multiple news organizations and I whitelist news sites I visit regularly.) Last week, as I was reading Twitter instead of working, I clicked on a link to a story from Texas Monthly that caught my eye. Naturally, I took a screenshot and tweeted it. But I wanted to know more: Why did Texas Monthly decide to do block ad blockers like this? Why did they decide to ask readers to sign up for their newsletter? What was the response from readers? So I got in touch with Texas Monthly and decided to focus this week’s issue of Solution Set on the magazine’s approach to ad blockers. Solution Set is a weekly report from The Lenfest Institute for Journalism and the Solutions Journalism Network. Every Thursday, we take an in-depth look at one dope thing in journalism, share lessons and point you toward other useful resources. • The Challenge: Texas Monthly wanted to explain to ad-blocking readers why digital advertising is an important part of its business. • The Numbers: Most ad-blocking readers are Xing out of the modal and continuing to read. • The Lessons: Texas Monthly built the infrastructure for this experiment from scratch, and can now use it for other tests. • The Future: The ad-blocking experiment is still ongoing and Texas Monthly plans to assess learnings in the coming weeks. • Want to know more? : Scroll down for some additional reading on ad-blockers. It’s hard for news organizations to make money online. Facebook and Google dominate digital advertising, and publications seeking reader revenue through subscriptions or memberships need to build products and editorial workflows designed to convince a sliver of their readership to pay. Texas Monthly knows this well. The magazine, which calls itself the national magazine of Texas, doesn’t charge for online access, but it sells ads across its website and other digital platforms such as newsletters and podcasts. And like all publishers in recent years, Texas Monthly noticed that ad-blocker usage was becoming more common and that platforms like Google and Apple have taken strong stances against intrusive advertising. While users block ads for a variety of reasons — ads can be intrusive, slow down your browser, use your data, etc. — Texas Monthly wanted its readers to understand the impact ad-blocking has on its business. “As we’ve noticed across the industry at large, not just on our site by any means, ad-blockers are on the rise,” Brett Bowlin, Texas Monthly’s director of digital strategy, told me. Texas Monthly says it only sells ads directly on its site, and it wanted to find a way to convey to readers that its ads aren’t invasive. It wanted “an opportunity to communicate to our readers about our advertising practices, and also communicate directly the value of the work we provide and how we make a profit in this business,” Bowlin said. On July 11, Texas Monthly launched an experiment. 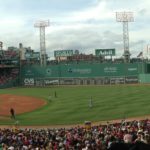 Any reader who comes to its desktop website and tries to read a story with an ad-blocker is presented with an interstitial modal asking them to turn off their ad-blocker. It then asks readers to take one of two courses of action: They can turn off their adblocker and whitelist Texas Monthly or they can sign up for the magazine’s weekly email. Readers actually have a third option as well: There’s a big X in the top right corner of the interstitial, and they can actually close it and continue reading with their ad-blocker on. 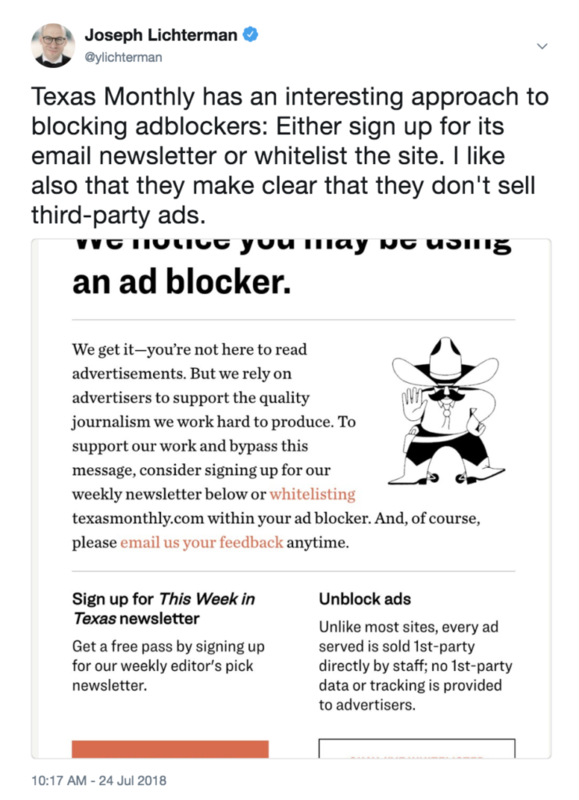 Bowlin said there were no major business imperatives for Texas Monthly to run this test of ad-blockers. Instead, the decision to run the experiment was part of a larger move the magazine is trying to make toward digital experimentation. Texas Monthly’s tech team was able to pretty quickly develop the interstitial functionality and get the experiment up and running. The limitations of its tech stack also impacted the study. Because it doesn’t sell digital subscriptions, Bowlin said the magazine doesn’t currently have the technology to enable readers to pay for access. It didn’t want to make any major investments for this experiment, so the magazine decided to ask readers to sign up for a newsletter instead and see if this would help them grow their email list. Because the test is ongoing, Bowlin wouldn’t share specific numbers. (I’m hopeful he’ll be willing to share more once it’s completed, though.) He did, however, give me a sense of how things were going. He said the percent of Texas Monthly readers who block ads were “well below” industry averages. A 2017 study from PageFair said 18 percent of US desktop Internet users ran ad-blockers. (FWIW, PageFair makes its money by helping companies get around ad-blockers.) Texas Monthly says it gets 1.1 million monthly unique visitors. The experiment has thus far resulted in a “slight decline” in the number of readers using ad-blockers. The “vast majority” of ad-blocking readers are just dismissing the interstitial, Bowlin said. “Quite a few more are whitelisting as compared to newsletter sign ups,” he said. Still, Texas Monthly has seen a slight a jump in subscribers to its weekly email, but “it’s not a watershed moment,” Bowlin said. (I know the list has increased by at least one because I signed up.) Texas Monthly says it has 78,000 total email subscribers across all its newsletters. 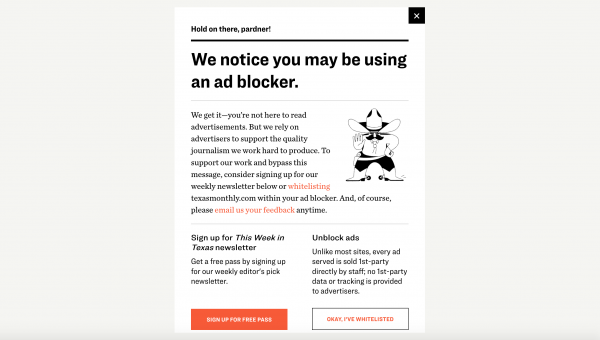 • Transparency wins: The ad-blocker modal encourages readers to email Texas Monthly with questions and feedback. The response has been “relatively minimal,” Bowlin said. Still, the magazine has heard from some readers, and reader feedback actually helped start the conversation about how it wanted to address ad-blocking and tell readers about its advertising practices. All of our digital advertising inventory is directly sold by Texas Monthly staff members on our sales team. Unlike most publications online, we do not solicit advertising opportunities to third-parties or advertising networks like Ad Exchange. On texasmonthly.com, we strive to have non-intrusive ads on our site. Most advertisers are local or regional. The ad creative used is pretty simplistic. We don’t use autoplay videos or pop-ups and we avoid topics that are controversial or include messages that are inaccurate. We try to make sure that our ads are relevant. Most of our advertisers are local and regional. Some of our biggest ad buys online are from Texas companies like Frost Bank, Texas Parks and Wildlife Foundation and Yeti. We do not perform cross-site tracking on behalf of advertisers, nor do we share any first-party data. Advertisers may choose, however, to set cookies themselves so they can track visitors, which is pretty standard. The last point is volume. The amount of ads we run on each page are pretty minimal compared to other publications. The New York Times may have double or triple the number of ads that we do typically. • Email is valuable: I’ve said this before in Solution Set, and I know I’ll keep repeating it: Email is a highly effective way of directly reaching readers and building habits. And If your publication is based on a digital subscription or membership model, email newsletters are critical for converting readers into loyal paying supporters. Publications can also run ads in newsletters that circumvent ad-blockers. Even though Texas Monthly partially chose to have the ad-blocker modal encourage email sign-ups due to technical issues, it also saw it as a way to more regularly expose readers to some of its best journalism. That’s why the interstitial directs readers to sign up for the magazine’s weekly email. Once users subscribe to the newsletter through the interstitial, they get an email welcoming them to the list. This is just Texas Monthly’s standard welcome email. The magazine doesn’t have any mechanism to create a differentiated welcome, but I think it would be worthwhile for publishers considering something similar to create distinct onboarding emails for ad-blocking users. You could also run a coordinated email campaign to orient readers to your site and share some of your best coverage. Welcome emails are a great opportunity to introduce readers to your coverage and give them more insight into the value they’re getting from your newsletter. • Experiments beget experiments: Texas Monthly built all-new infrastructure for its ad-blocking experience. But now that it has the ability to put up interstitials, Bowlin said it’s already thinking about ways it can utilize the functionality. Texas Monthly built the modal to be able to pull content from its CMS, its ad servers and elsewhere, so it will be able to test different editorial and business use cases. Bowlin said the magazine plans to evaluate results of this current experiment and will decide similarly if it wants to use the tool to target specific audiences. “Generally, my philosophy is that when we invest in a product, we want as many reusable pieces as possible,” he said. 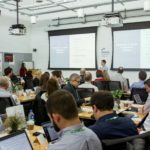 News organizations should always be testing, and by investing in re-usable technology and infrastructure, publications can easily run multiple experiments. The magazine is also considering other ways to test blocking the ad-blockers. One idea is running a limited test that would stop people from disabling the modal without signing up for a newsletter or whitelisting the site. “This is the first time we’ve targeted users with ad-blockers, for example, so as we carry out this exercise that will inform what kind of targets we can hit,” he said. • The Financial Times last year toughened its approach to ad-blockers. Digiday has the details. • Salon has taken an, um, creative approach to discouraging adblocking. Earlier this year, Salon asked readers with ad-blockers on to allow it to use extra computing power to mine cryptocurrency. Here’s Ars Technica’s report. • I wrote a recent Solution Set about an experiment at the Bay Area News Group that asked readers using an adblocker to pay more for a subscription. Are adblockers a topic of discussion in your newsroom? What’s your news organization’s stragegy? Let me know! Send me an email, I’m at [email protected]. I’ll include some responses in a future issue of Solution Set. I won’t see you next Thursday, but The Lenfest Institute’s awesome interns, Anh Nguyen and David Akst, will. They’re going to be taking over the next few issues of Solution Set. They’re both reporting out some fascinating stories now. You’re going to like them. Creative Commons photo by James Walsh.